Home › Transgender, Transsexual, Trans › Deaths, Murder › Trans and unmarried? Get your legal affairs in order, pronto! Trans and unmarried? Get your legal affairs in order, pronto! 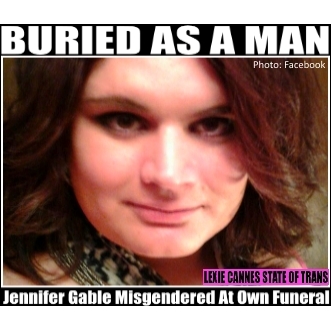 LEXIE CANNES STATE OF TRANS — Otherwise, if you’re a trans woman and suddenly drop dead, you might find yourself buried as a man (or vice versa if you’re a trans man). This is exactly what happened to Jennifer Gable, a trans woman in Twin Falls, Idaho. Dead from a sudden aneurysm at work, her friends were stunned a second time at her funeral when they saw her in a casket presented as a man, wearing a suit and hair cut short. The obituary? Her former name, male pronouns and no mention of who she really was. All this, likely perfectly legal. While the entire story may have not been told at this time, it’s enough to give pause to ask yourself if your own legal affairs are in order to prevent this from happening to you? From wiki re: ‘next of kin’: Decisions about funeral arrangements for an unmarried person without children may be made by the next closest relative. Let me go further: In the event of a dispute between friends and ‘next of kin’, the latter likely has stronger legal standing. A Will might not be enough. In some cases, wills may not be read until after the funeral or simply not located in time. A ‘Power of Attorney’ isn’t always enough. In some cases, the POA expires at the moment of death, at which time legal decisions may transfer back to next of kin. A trans person should have a legal document made up by an attorney that authorizes a specific person(s) by name to make decisions in the event you are incapacitated and/or suddenly decease. And a copy needs to be given to that person so they have it available should the need occur. The document is of no value if it is filed away with with your will or if a family member chooses not to disclose it. This is especially urgent if you are estranged from any family member(s), including your own kids. Note: I am not an attorney but I’ve seen enough bizarro funerals and strife following death to know this is a matter in need of an immediate phone call to your attorney if you’re not protected. Thank you for the great advice. What happened to Jennifer is a travesty. Thank you for the heads up. People should check things out and find out their legal rights in their state/county/municipality and take whatever steps they can to assure that their personal wishes are carried out in the event of incapacity or death. This story is shockingly sad on so many levels. Being erased like this is almost as bad being killed for being trans. Will have to make sure, those who know me, do the right thing.